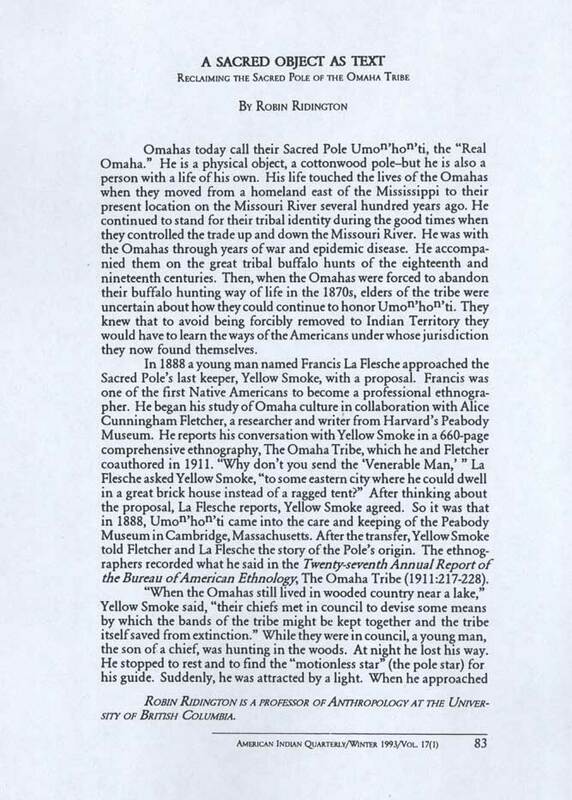 Omahas today call their Sacred Pole Umoⁿ'hoⁿ'ti, the "Real Omaha." He is a physical object, a cottonwood pole—but he is also a person with a life of his own. His life touched the lives of the Omahas when they moved from a homeland east of the Mississippi to their present location on the Missouri River several hundred years ago. He continued to stand for their tribal identity during the good times when they controlled the trade up and down the Missouri River. He was with the Omahas through years of war and epidemic disease. He accompanied them on the great tribal buffalo hunts of the eighteenth and nineteenth centuries. Then, when the Omahas were forced to abandon their buffalo hunting way of life in the 1870s, elders of the tribe were uncertain about how they could continue to honor Umoⁿ'hoⁿ'ti. They knew that to avoid being forcibly removed to Indian Territory they would have to learn the ways of the Americans under whose jurisdiction they now found themselves. In 1888 a young man named Francis La Flesche approached the Sacred Pole's last keeper, Yellow Smoke, with a proposal. Francis was one of the first Native Americans to become a professional ethnographer. He began his study of Omaha culture in collaboration with Alice Cunningham Fletcher, a researcher and writer from Harvard's Peabody Museum. He reports his conversation with Yellow Smoke in a 660-page comprehensive ethnography, The Omaha Tribe, which he and Fletcher coauthored in 1911. "Why don't you send the 'Venerable Man,' " La Flesche asked Yellow Smoke, "to some eastern city where he could dwell in a great brick house instead of a ragged tent?" After thinking about the proposal, La Flesche reports, Yellow Smoke agreed. So it was that in 1888, Umoⁿ'hoⁿ'ti came into the care and keeping of the Peabody Museum in Cambridge, Massachusetts. After the transfer, Yellow Smoke told Fletcher and La Flesche the story of the Pole's origin. 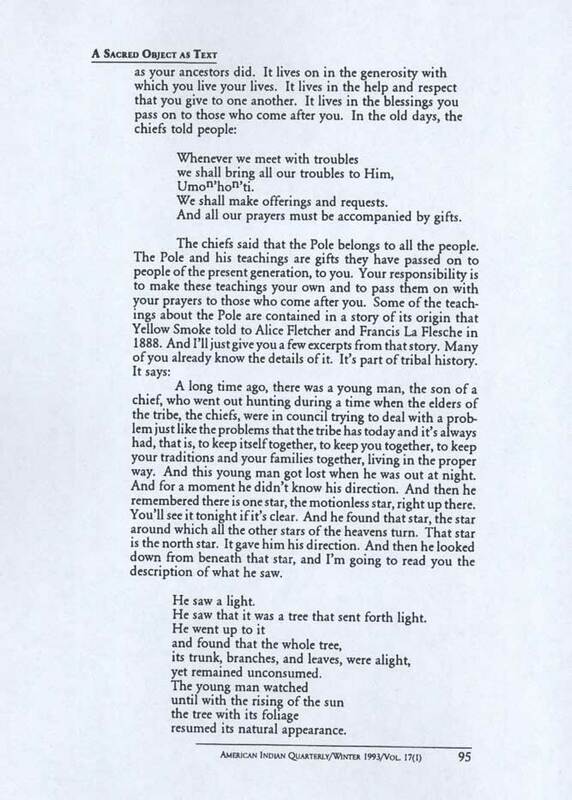 The ethnographers recorded what he said in the Twenty-seventh Annual Report of the Bureau of American Ethnology, The Omaha Tribe (1911:217-228). My son has seen a wonderful tree. making a trail of fire that leaves four paths on the burnt grass that stretch toward the Four Winds. it bursts into flame and the fire mounts to the top. The tree stands burning, but no one can see the fire except at night. You now see before you a mystery. Whenever we meet with troubles we shall bring all our troubles to Him (The Pole). We shall make offerings and requests. All our prayers must be accompanied by gifts. This (the Pole) belongs to all the people, but it shall be in the keeping of one family in the Honga clan. when a boy named Francis La Flesche nearly ran down the Pole and its keeper with his father's horses. They wept for the Pole's century of confinement. They wept for joy at his release. And they wept to see him refreshed by sun and wind after so many years within the walls of the "great brick house." 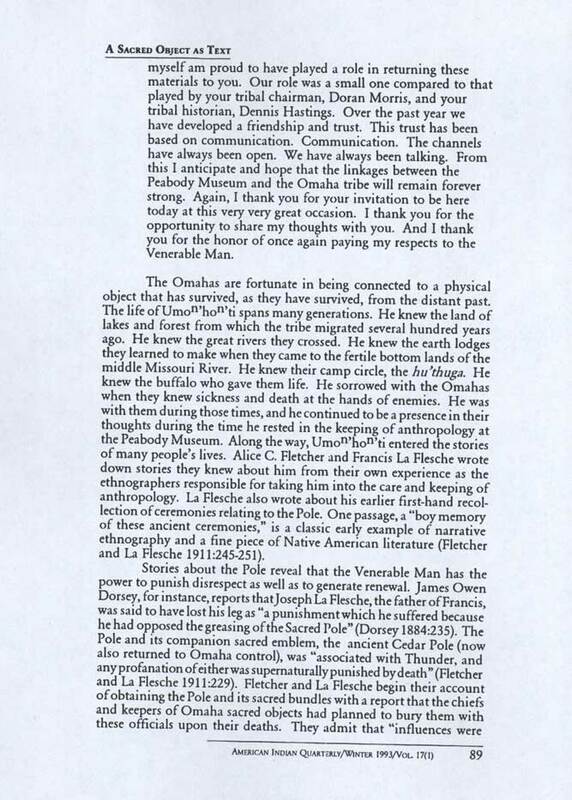 On July 12 of the following year, 1989, Mr. Joe Johns, a Creek artist-in-residence at the Peabody, escorted Umoⁿ'hoⁿ'ti back to the Omaha tribal arena in Macy, Nebraska. Tribal chairman Doran Morris received the Pole on behalf of all Omahas in the hope that his return to the tribal circle will bring all his relations a "blessing for a long time to come." The successful completion of the transfer was not without some difficult moments. Close cooperation between Omaha tribal historian Dennis Hastings and Peabody curator Ian Brown turned out to be essential to the process. Initially the tribe had hoped to obtain temporary storage in Omaha's Joslyn art museum, but at the last moment this plan fell through. A resolution of the problem came when Dennis Hastings made contact with the University of Nebraska at Lincoln and requested that they provide the collection with interim curatorial care on behalf of the tribe. The university agreed to house the Pole until such time as the Omahas are able to realize their long-range plan of building a tribal cultural center on the reservation. to Lincoln rather than to Omaha, the Pole found himself back among the people who cared for him more than half a century before he went to the Peabody. His return to where his people were housed also had the benefit of easing what had been a potential confrontation between the tribe and the university over the issue of reburial. At the time the tribe was negotiating the transfer with the Peabody, they were also attempting to obtain the return of the Ton'wontonga remains and had been instrumental in passing State legislation concerning the question of reburial. 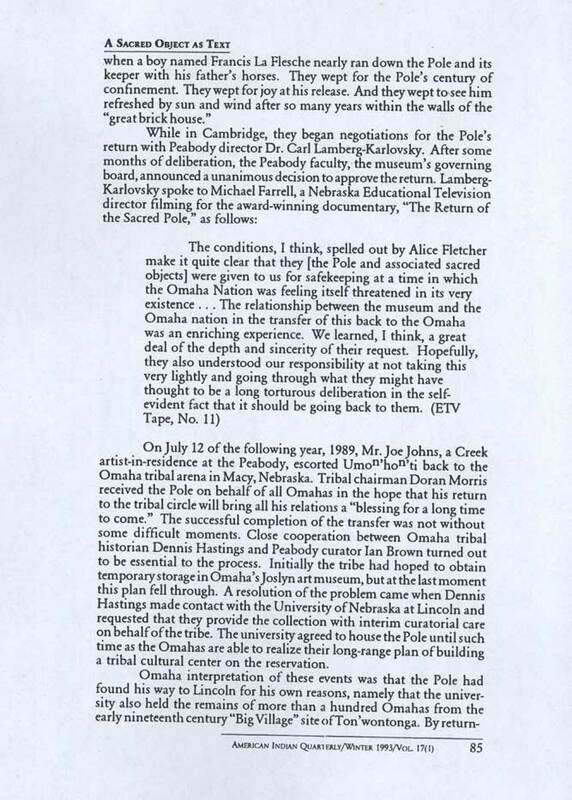 The good relationship that developed with respect to the Pole made it possible for the university and the tribe to develop a cooperative solution to the issue of returning the bones. The university agreed to undertake extensive scientific investigation of the remains in order to provide the Omahas with information about the health and living standards of their nineteenth-century ancestors. They also agreed to return the remains for reburial upon completion of their studies. 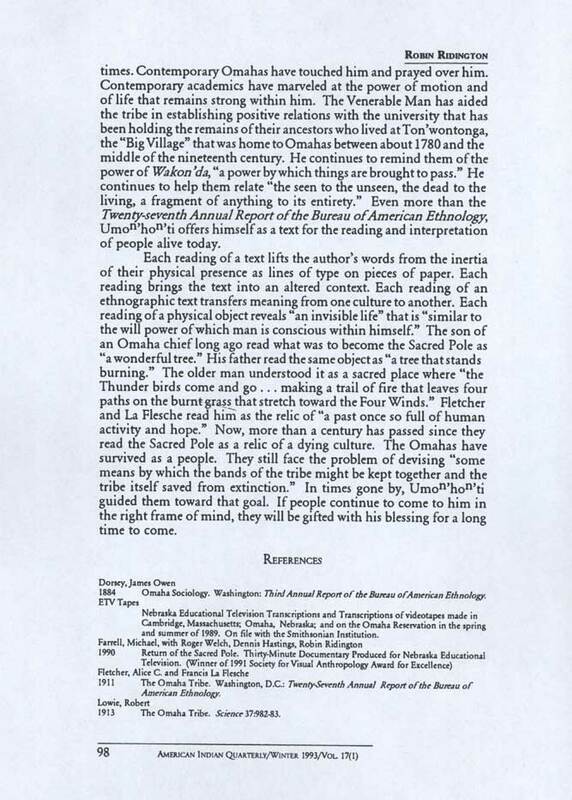 These studies were completed in the fall of 1991, and in October of that year the Ton'wontonga people were reburied on reservation land near the Missouri river bluffs, close to the site of the proposed cultural center. Generations of non-Native colonizers and their descendants have predicted that Native Americans were a "vanishing race." Margaret Mead described the Omahas as "culturally deprived" and a "broken culture" in 1932 (Mead 1932:ix-xii). As the 500th anniversary of the Columbus voyage recedes into history, aboriginal people are still a vital presence in this land. They survive as communities of relations. They survive in ceremonies and prayers. They survive in the gifts they give to honor one another. They survive as dancers and singers. They survive in the stories they tell of one another's lives. They survive when they conclude a sweat or ceremony by saying, "All my relations." They survive in cities and on reservations. They survive as nations. They survive. 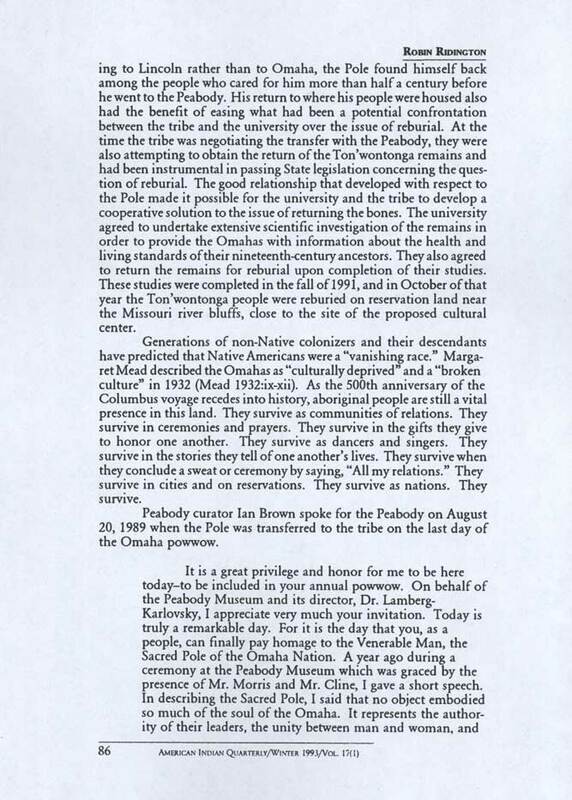 Peabody curator Ian Brown spoke for the Peabody on August 20, 1989 when the Pole was transferred to the tribe on the last day of the Omaha powwow. the binding element that has held the Omaha people together for centuries. In a recent article dealing with Indian policy and Indian religious freedom, Patrick Morse writes (I quote), "Collectively sacred things tell us that life and spirit are continuous. They coexist and are not bound by immutable substance. Their sacredness comes from their inseparable unity with creation." A little over a century ago the linkage between life and spirit appeared to be broken for the Omaha. Alice Fletcher, an anthropologist at the Peabody Museum who spent many years among the Omaha, was convinced that the people she loved would soon cease to exist. Eventually, she thought, the Omaha would dissolve into the Great American melting pot. They would become indistinguishable from anyone else. Their religion, their spirit, would be lost in the march of time. There was no doubt in her mind that this would happen, and she herself even played a role in making it happen in her support of the infamous Dawes Act, an act whose main purpose it turns out was to separate the Indians from their land. Indian culture, religion, beliefs, languages would soon be dead, or at least this was the thought of anthropologists, missionaries, and government officials of the late nineteenth century. Fletcher certainly was no exception to this belief, but she did feel that something could be preserved to teach later generations of the once rich life of the Omaha. If not the people, at least the sacred materials of the Omaha could be saved. And this objective was eventually fulfilled through the agency of her Omaha Indian colleague, Francis La Flesche. In the 1880s many sacred materials of the Omaha came to the "Great Brick House" in the East which I represent today. The Sacred Pole was one of those items. Since 1888 it has rested in the Peabody Museum, protected from the ravages of time, studied by several generations of anthropologists, but certainly, certainly not revered. Its sacred nature continued, however, because the Omaha themselves continued. Fletcher was wrong. The missionaries were wrong. And the government bureaucrats were dead wrong. George P. Horsecapture recently wrote in the preface to his book, Sacred Materials, that (I quote) "Indians are special and unique. Despite their turbulent history they have managed to survive, keeping relatively intact many of their traditional ways. One of the major cultural traits that holds these people together and is least understood by non-Indians is sacredness." 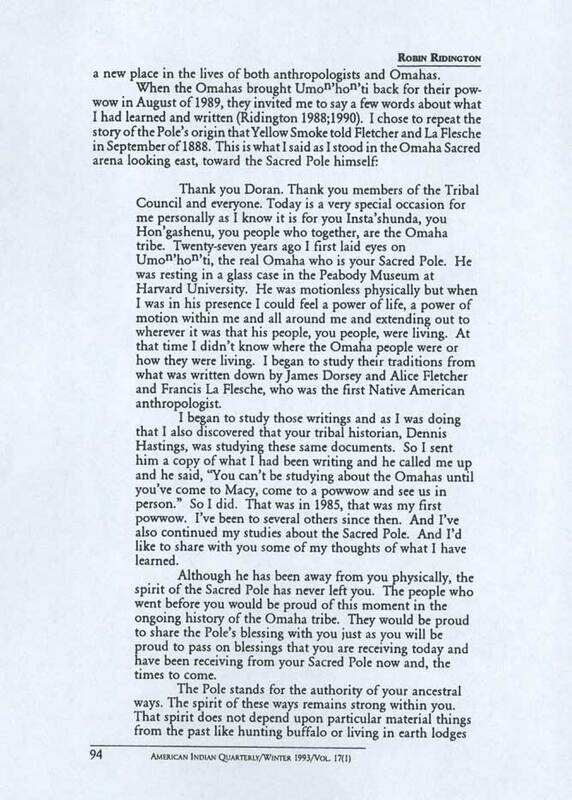 negotiations concerning the return of the Sacred Pole and the remainder of your sacred materials, a number of us at the Peabody Museum received letters from various individuals asking for a speedy return of the objects. I would like to read portions of two of these letters. The first letter is from Robert Wolf who, at the time of his writing, was thirteen years old and attending the Lincoln Lutheran junior high. 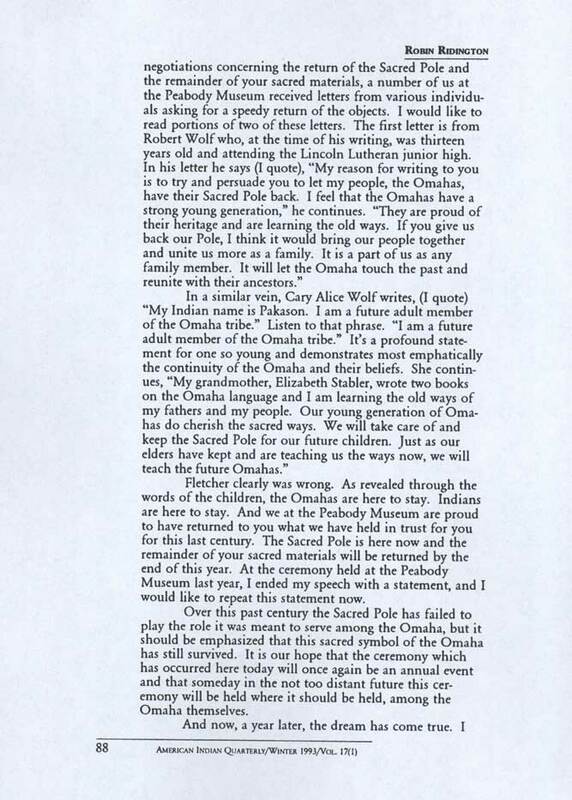 In his letter he says (I quote), "My reason for writing to you is to try and persuade you to let my people, the Omahas, have their Sacred Pole back. I feel that the Omahas have a strong young generation," he continues. "They are proud of their heritage and are learning the old ways. If you give us back our Pole, I think it would bring our people together and unite us more as a family. It is a part of us as any family member. It will let the Omaha touch the past and reunite with their ancestors." In a similar vein, Cary Alice Wolf writes, (I quote) "My Indian name is Pakason. I am a future adult member of the Omaha tribe." Listen to that phrase. "I am a future adult member of the Omaha tribe." It's a profound statement for one so young and demonstrates most emphatically the continuity of the Omaha and their beliefs. She continues, "My grandmother, Elizabeth Stabler, wrote two books on the Omaha language and I am learning the old ways of my fathers and my people. Our young generation of Omahas do cherish the sacred ways. We will take care of and keep the Sacred Pole for our future children. Just as our elders have kept and are teaching us the ways now, we will teach the future Omahas." Fletcher clearly was wrong. As revealed through the words of the children, the Omahas are here to stay. Indians are here to stay. And we at the Peabody Museum are proud to have returned to you what we have held in trust for you for this last century. The Sacred Pole is here now and the remainder of your sacred materials will be returned by the end of this year. At the ceremony held at the Peabody Museum last year, I ended my speech with a statement, and I would like to repeat this statement now. Over this past century the Sacred Pole has failed to play the role it was meant to serve among the Omaha, but it should be emphasized that this sacred symbol of the Omaha has still survived. It is our hope that the ceremony which has occurred here today will once again be an annual event and that someday in the not too distant future this ceremony will be held where it should be held, among the Omaha themselves. myself am proud to have played a role in returning these materials to you. Our role was a small one compared to that played by your tribal chairman, Doran Morris, and your tribal historian, Dennis Hastings. Over the past year we have developed a friendship and trust. This trust has been based on communication. Communication. The channels have always been open. We have always been talking. From this I anticipate and hope that the linkages between the Peabody Museum and the Omaha tribe will remain forever strong. Again, I thank you for your invitation to be here today at this very very great occasion. I thank you for the opportunity to share my thoughts with you. And I thank you for the honor of once again paying my respects to the Venerable Man. The Omahas are fortunate in being connected to a physical object that has survived, as they have survived, from the distant past. The life of Umoⁿ'hoⁿ'ti spans many generations. He knew the land of lakes and forest from which the tribe migrated several hundred years ago. He knew the great rivers they crossed. He knew the earth lodges they learned to make when they came to the fertile bottom lands of the middle Missouri River. He knew their camp circle, the hu'thuga. He knew the buffalo who gave them life. He sorrowed with the Omahas when they knew sickness and death at the hands of enemies. He was with them during those times, and he continued to be a presence in their thoughts during the time he rested in the keeping of anthropology at the Peabody Museum. Along the way, Umoⁿ'hoⁿ'ti entered the stories of many people's lives. Alice C. Fletcher and Francis La Flesche wrote down stories they knew about him from their own experience as the ethnographers responsible for taking him into the care and keeping of anthropology. 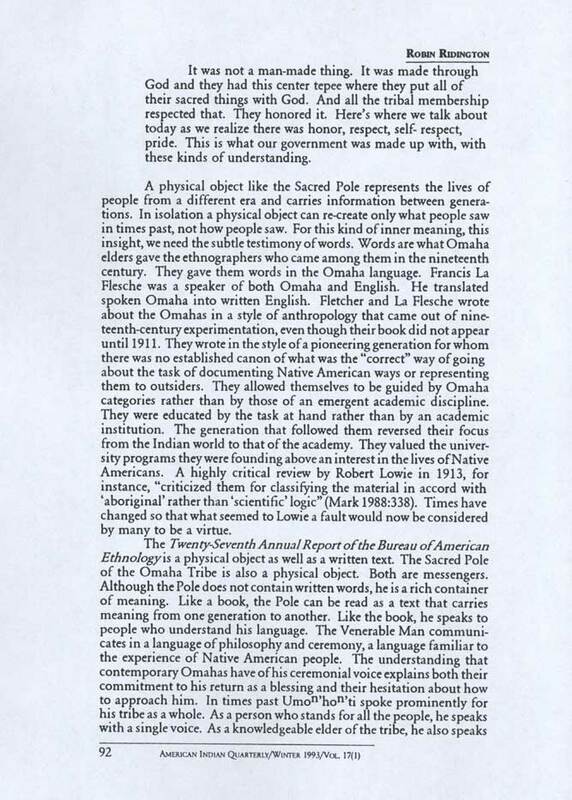 La Flesche also wrote about his earlier first-hand recollection of ceremonies relating to the Pole. One passage, a "boy memory of these ancient ceremonies," is a classic early example of narrative ethnography and a fine piece of Native American literature (Fletcher and La Flesche 1911:245-251). brought to bear on the chiefs and their keepers to prevent the carrying out of the plan for burial" (1911:222). For these influences, they say, "great credit must be given to the late Inshta'maza [Iron Eye] Joseph La Flesche, former principal chief of the tribe" (1911:222). Recent Omaha opinion concurs with their inference that the transfer was less than spontaneous. Some even say that La Flesche took the Pole without Yellow Smoke's consent, although that seems unlikely given the great moral authority and respect the keeper commanded. The fear inspired by the Pole was such that it seemed as though it would be impossible to gain this information, but the desired result was finally brought about, and one summer day in September, 1888, old Shu'denachi (Smoked Yellow [Yellow Smoke]; refers to the Sacred Tent of the Hon'ga gens), came to the house of Joseph La Flesche to tell the legend of his people treasured with the Sacred Pole" (1911:223). 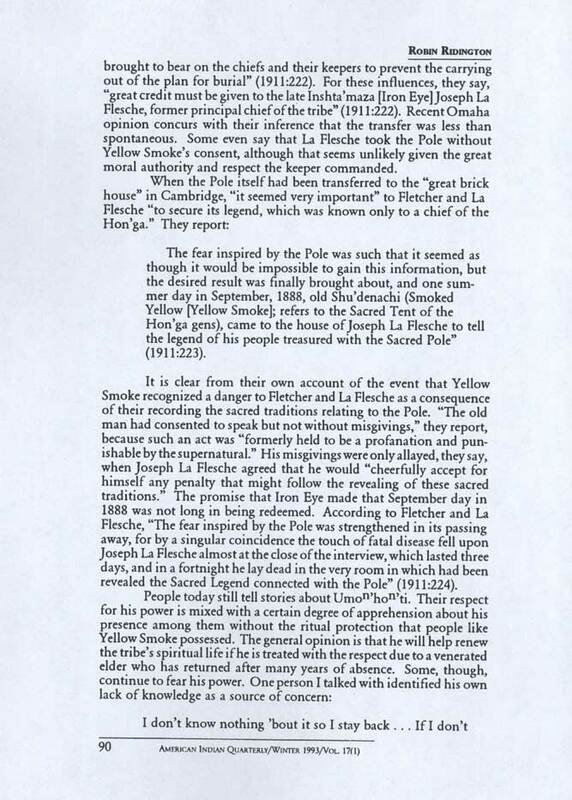 It is clear from their own account of the event that Yellow Smoke recognized a danger to Fletcher and La Flesche as a consequence of their recording the sacred traditions relating to the Pole. "The old man had consented to speak but not without misgivings," they report, because such an act was "formerly held to be a profanation and punishable by the supernatural." His misgivings were only allayed, they say, when Joseph La Flesche agreed that he would "cheerfully accept for himself any penalty that might follow the revealing of these sacred traditions." The promise that Iron Eye made that September day in 1888 was not long in being redeemed. According to Fletcher and La Flesche, "The fear inspired by the Pole was strengthened in its passing away, for by a singular coincidence the touch of fatal disease fell upon Joseph La Flesche almost at the close of the interview, which lasted three days, and in a fortnight he lay dead in the very room in which had been revealed the Sacred Legend connected with the Pole" (1911:224). know something 'bout something I ain't gonna, you know, go up expose to it or get by it or something. I don't know nothing about it...My grandma didn't tell me nothin' 'bout it. I'm the oldest son but I don't know nothing 'bout it. But if it's good, if it's good like they say the Sacred Pole, if it's good, boy, go ahead. The way I would refer to the Sacred Pole is that it is a being. This was done with God after our people realized that in the days of the beginning they talked to nature. They talked to the trees, they talked to the birds, they talked to the sky and they talked to Mother Earth. Everything here was created by what they referred to as the Holy Spirit. And they come to realize that this Holy Spirit was the Creator of all living things here on earth. He made it possible for everything that they could see on Mother Earth here. They took and cut a tree down, taking life from the ground itself, this tree. They took this tree and made it into what we today refer to as the Sacred Pole. The people made their pact, or agreement, with the Great Spirit that this tree here as they took life from it, that this pole was to be in disguise of those who were to be born to the membership of the tribe thereafter. This is in disguise of those of us that are going to be living and to be born to the membership of the tribe. This is what that Sacred Pole was supposed to be here on earth with the tribal membership here with God. And this Sacred Pole was put into a tepee. They respected it, looked at it in the manner of life. Life itself with God. And only those members of that Holy Society had the rights, responsibilities over this tepee. This center one. No other people, meaning the tribal membership that was not of the Holy Society, didn't have the right to be within that big circle. We had to be on the outside of that. It was not a man-made thing. It was made through God and they had this center tepee where they put all of their sacred things with God. And all the tribal membership respected that. They honored it. Here's where we talk about today as we realize there was honor, respect, self-respect, pride. This is what our government was made up with, with these kinds of understanding. A physical object like the Sacred Pole represents the lives of people from a different era and carries information between generations. In isolation a physical object can recreate only what people saw in times past, not how people saw. For this kind of inner meaning, this insight, we need the subtle testimony of words. Words are what Omaha elders gave the ethnographers who came among them in the nineteenth century. They gave them words in the Omaha language. Francis La Flesche was a speaker of both Omaha and English. He translated spoken Omaha into written English. 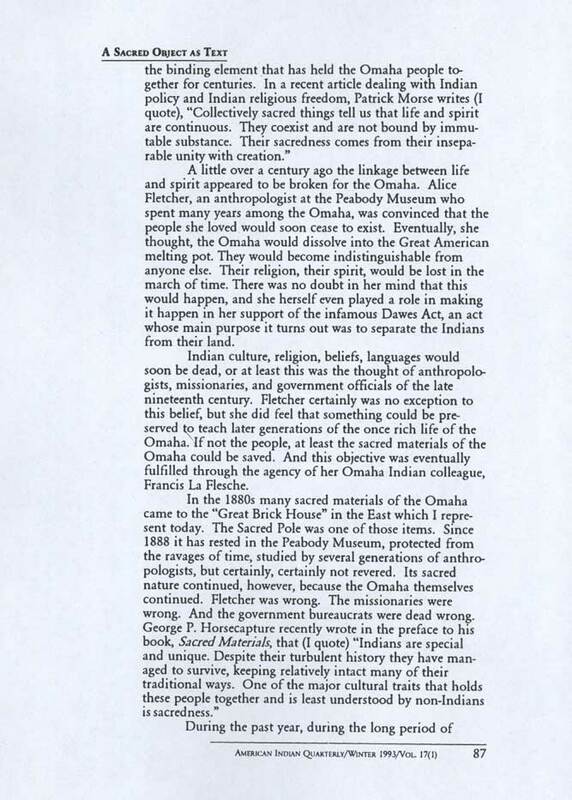 Fletcher and La Flesche wrote about the Omahas in a style of anthropology that came out of nineteenth-century experimentation, even though their book did not appear until 1911. They wrote in the style of a pioneering generation for whom there was no established canon of what was the "correct" way of going about the task of documenting Native American ways or representing them to outsiders. They allowed themselves to be guided by Omaha categories rather than by those of an emergent academic discipline. They were educated by the task at hand rather than by an academic institution. The generation that followed them reversed their focus from the Indian world to that of the academy. They valued the university programs they were founding above an interest in the lives of Native Americans. A highly critical review by Robert Lowie in 1913, for instance, "criticized them for classifying the material in accord with 'aboriginal' rather than 'scientific' logic" (Mark 1988:338). Times have changed so that what seemed to Lowie a fault would now be considered by many to be a virtue. in the multiple voices of his various parts. He speaks in the intricate language of ceremonial exchange. The Omahas have always thought of themselves as a tribe composed of complementary halves, the Sky People (Insta'shunda) and the Earth People (Hon'gashenu). Umoⁿ'hoⁿ'ti is a single person in whom these halves have joined. He is a venerable man but he also reminds people of a compassionate female principle that Alice Fletcher called "the great mother force." He speaks both for men and for women. He speaks for Sky People and Earth People. He gives voice to Omaha sacred texts in the way that scriptures give voice to the sacred traditions of other peoples. Omahas understand his power but they no longer have experts who remember the ceremonial discourse of which he was once an integral part. What they do remember is their own contemporary ceremonies and reciprocities. They are taking their time to integrate him back into the full expression of Omaha ceremonial tradition. Umoⁿ'hoⁿ'ti is a person who accumulated many stories during his long life. You can read some of these stories in his very appearance. He bears the signature of much devotion. For many years, people fed him with buffalo meat. Each year they painted him with buffalo fat mixed with red pigment. They wrapped him with a piece of leather called a'shondepa, "the word used to designate the leather shield worn on the wrist of an Indian to protect it from the bowstring." Fletcher and La Flesche explain that, "This name affords unmistakable evidence that the Pole was intended to symbolize a man, as no other creature could wear the bowstring shield. It indicates also that the man thus symbolized was one who was both a provider for and a protector of his people" (p. 225). The Sacred Pole is remarkable because he is a physical object that has survived from a distant past. He is remarkable because he is sacred and alive with meaning. 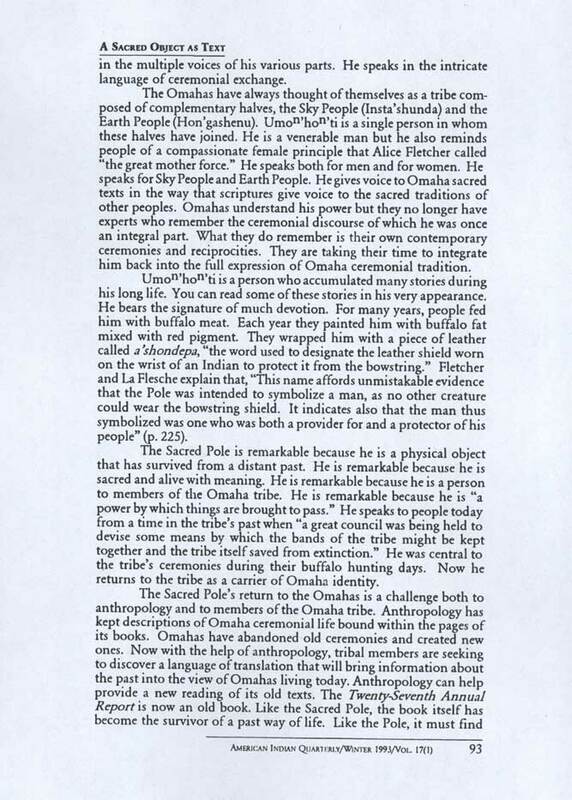 He is remarkable because he is a person to members of the Omaha tribe. He is remarkable because he is "a power by which things are brought to pass." He speaks to people today from a time in the tribe's past when "a great council was being held to devise some means by which the bands of the tribe might be kept together and the tribe itself saved from extinction." He was central to the tribe's ceremonies during their buffalo hunting days. Now he returns to the tribe as a carrier of Omaha identity. a new place in the lives of both anthropologists and Omahas. Thank you Doran. Thank you members of the Tribal Council and everyone. Today is a very special occasion for me personally as I know it is for you Insta'shunda, you Hon'gashenu, you people who together, are the Omaha tribe. Twenty-seven years ago I first laid eyes on Umoⁿ'hoⁿ'ti, the real Omaha who is your Sacred Pole. He was resting in a glass case in the Peabody Museum at Harvard University. He was motionless physically but when I was in his presence I could feel a power of life, a power of motion within me and all around me and extending out to wherever it was that his people, you people, were living. At that time I didn't know where the Omaha people were or how they were living. I began to study their traditions from what was written down by James Dorsey and Alice Fletcher and Francis La Flesche, who was the first Native American anthropologist. I began to study those writings and as I was doing that I also discovered that your tribal historian, Dennis Hastings, was studying these same documents. So I sent him a copy of what I had been writing and he called me up and he said, "You can't be studying about the Omahas until you've come to Macy, come to a powwow and see us in person." So I did. That was in 1985, that was my first powwow. I've been to several others since then. 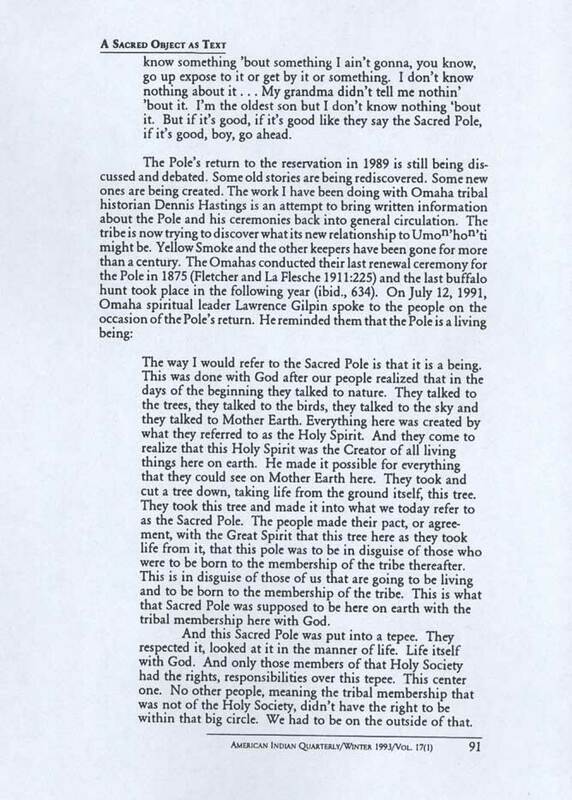 And I've also continued my studies about the Sacred Pole. And I'd like to share with you some of my thoughts of what I have learned. Although he has been away from you physically, the spirit of the Sacred Pole has never left you. The people who went before you would be proud of this moment in the ongoing history of the Omaha tribe. They would be proud to share the Pole's blessing with you just as you will be proud to pass on blessings that you are receiving today and have been receiving from your Sacred Pole now and, the times to come. And all our prayers must be accompanied by gifts. A long time ago, there was a young man, the son of a chief, who went out hunting during a time when the elders of the tribe, the chiefs, were in council trying to deal with a problem just like the problems that the tribe has today and it's always had, that is, to keep itself together, to keep you together, to keep your traditions and your families together, living in the proper way. And this young man got lost when he was out at night. And for a moment he didn't know his direction. And then he remembered there is one star, the motionless star, right up there. You'll see it tonight if it's clear. And he found that star, the star around which all the other stars of the heavens turn. That star is the north star. It gave him his direction. And then he looked down from beneath that star, and I'm going to read you the description of what he saw. He saw that it was a tree that sent forth light. He remained by it throughout the day. and continued so until the sun rose again. When the young man returned home he told his father of the wonder. Together they went to see the tree. that had escaped the notice of the young man. This was that four animal paths led to it. and polished its bark by doing so. that stretch toward the Four Winds. and the fire mounts to the top. and no one can see the fire except at night. The men of the tribe returned to the tree. They painted themselves. They put on their regalia. as if it were an enemy warrior. The first to reach the tree struck it and then they cut down the tree. 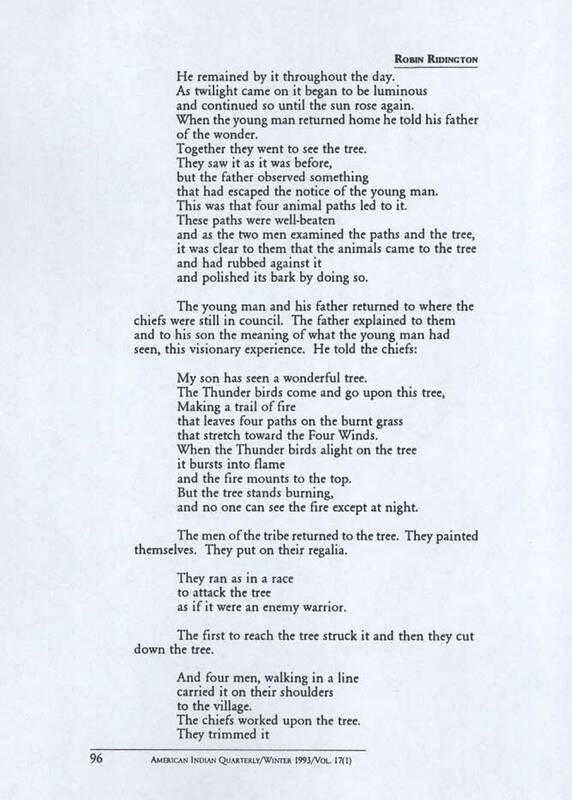 The chiefs worked upon the tree. and called it a human being. and tied it in the middle. They made a tent for the tree and set it up within the circle of lodges. They placed a large scalp lock on top of the Pole for hair. which they called imongthe(a staff). we shall bring all our troubles to Him. This belongs to all the people. the battles we have fought. This was the beginning of the ceremony called Waxthexe xigithe, which means "to, paint, to anoint, to grease the Sacred Pole with red." Although that old ceremony of renewal was part of your buffalo hunting way of life and is no longer practiced, the spirit of renewal remains very much alive among you today. 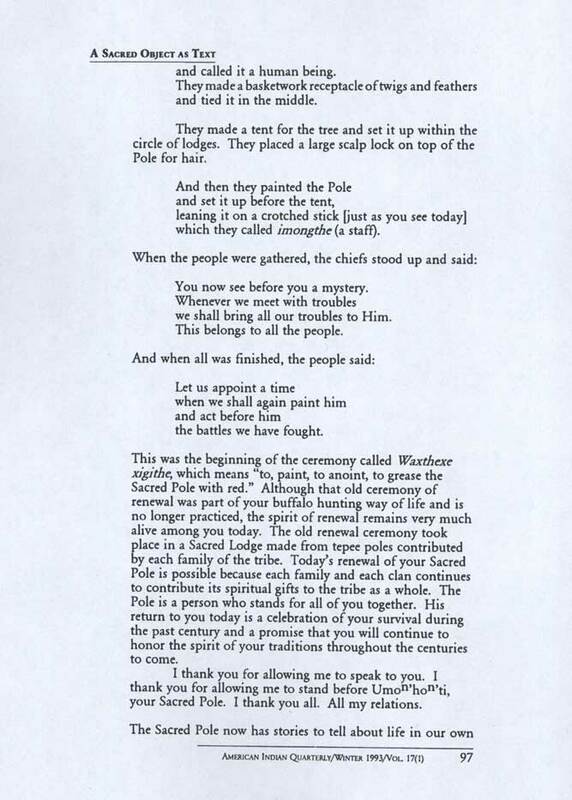 The old renewal ceremony took place in a Sacred Lodge made from tepee poles contributed by each family of the tribe. Today's renewal of your Sacred Pole is possible because each family and each clan continues to contribute its spiritual gifts to the tribe as a whole. The Pole is a person who stands for all of you together. His return to you today is a celebration of your survival during the past century and a promise that you will continue to honor the spirit of your traditions throughout the centuries to come. I thank you for allowing me to speak to you. I thank you for allowing me to stand before Umó'hó'ti, your Sacred Pole. I thank you all. All my relations. times. Contemporary Omahas have touched him and prayed over him. Contemporary academics have marveled at the power of motion and of life that remains strong within him. The Venerable Man has aided the tribe in establishing positive relations with the university that has been holding the remains of their ancestors who lived at Ton'wontonga, the "Big Village" that was home to Omahas between about 1780 and the middle of the nineteenth century. He continues to remind them of the power of Wakon'da, "a power by which things are brought to pass." He continues to help them relate "the seen to the unseen, the dead to the living, a fragment of anything to its entirety." Even more than the Twenty-seventh Annual Report of the Bureau of American Ethnology, Umoⁿ'hoⁿ'ti offers himself as a text for the reading and interpretation of people alive today. Each reading of a text lifts the author's words from the inertia of their physical presence as lines of type on pieces of paper. Each reading brings the text into an altered context. Each reading of an ethnographic text transfers meaning from one culture to another. Each reading of a physical object reveals "an invisible life" that is "similar to the will power of which man is conscious within himself." 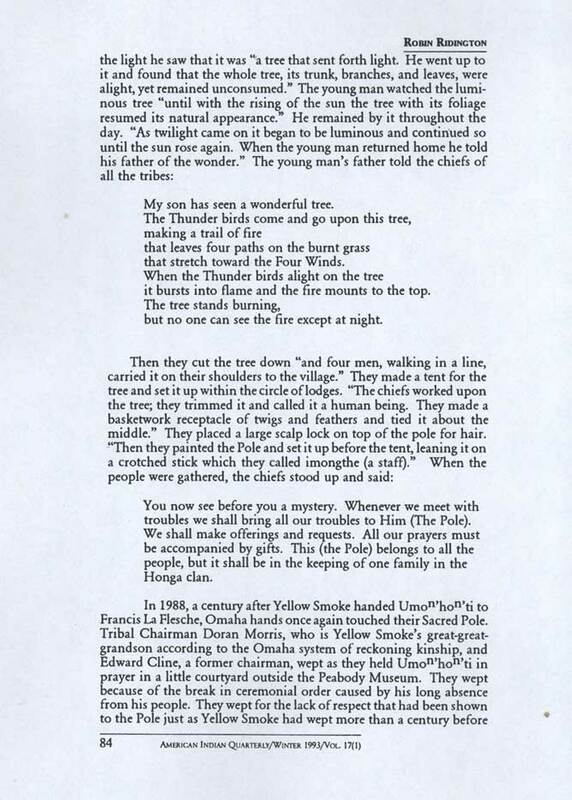 The son of an Omaha chief long ago read what was to become the Sacred Pole as "a wonderful tree." His father read the same object as "a tree that stands burning." The older man understood it as a sacred place where "the Thunder birds come and go ... making a trail of fire that leaves four paths on the burnt grass that stretch toward the Four Winds." Fletcher and La Flesche read him as the relic of "a past once so full of human activity and hope." Now, more than a century has passed since they read the Sacred Pole as a relic of a dying culture. The Omahas have survived as a people. They still face the problem of devising "some means by which the bands of the tribe might be kept together and the tribe itself saved from extinction." In times gone by, Umoⁿ'hoⁿ'ti guided them toward that goal. If people continue to come to him in the right frame of mind, they will be gifted with his blessing for a long time to come. 1884	Omaha Sociology. Washington: Third Annual Report of the Bureau of American Ethnology. 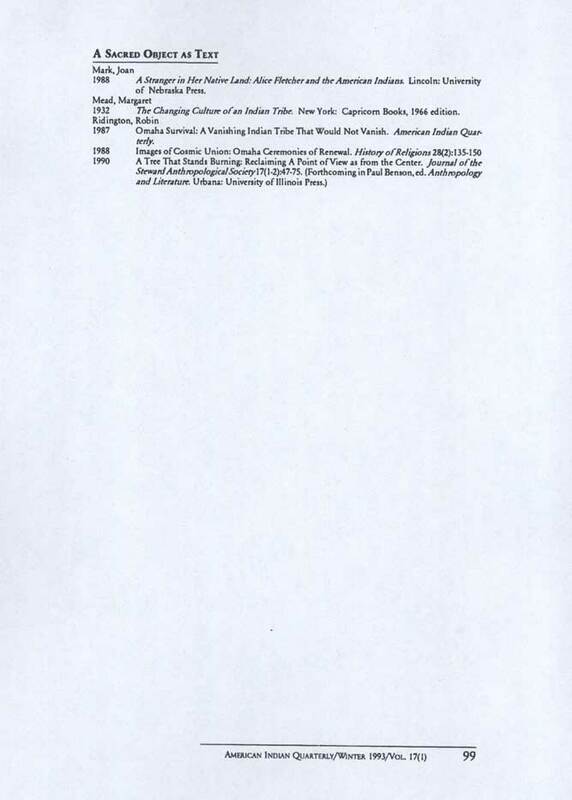 Nebraska Educational Television Transcriptions and Transcriptions of videotapes made in Cambridge, Massachusetts; Omaha, Nebraska; and on the Omaha Reservation in the spring and summer of 1989. On file with the Smithsonian Institution. 1911	The Omaha Tribe. Washington, D.C.: Twenty-Seventh Annual Report of the Bureau of American Ethnology. 1913	The Omaha Tribe. Science 37:982-83. 1988	A Stranger in Her Native Land: Alice Fletcher and the American Indians. Lincoln: University of Nebraska Press. 1932	The Changing Culture of an Indian Tribe. New York: Capricorn Books, 1966 edition. 1987	Omaha Survival: A Vanishing Indian Tribe That Would Not Vanish. American Indian Quarterly.